The QC-S30 Collator is one of the worlds fastest tabletop friction feed collators, and can be built into a 3-tower table top friction feed collating system. The modular design of the system allows the flexibility to expand with additional components as production needs grow. The QC-S30’s innovative design allow 10, 20, 30 stations, offers speed and quality construction, and will provide years of superior productivity and reliability. Accessories for the QC-S30 Collator include the PS-P61 Corner Stapler and SPF9/FC-9. 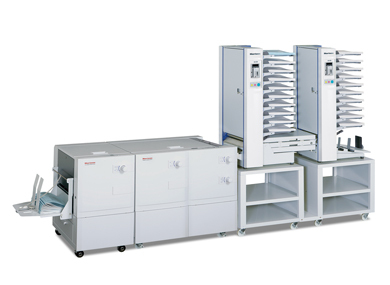 The SPF9/FC9 bookletmaking accessories are simple to run and offer many features found in much larger machines, such as programming and 100% accuracy for miss and double detection. 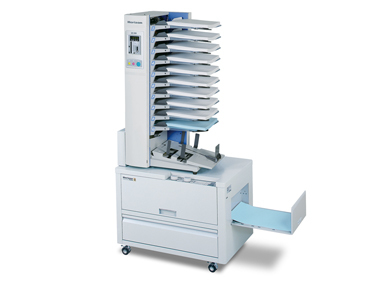 The PS-P61 Stapler in-line with the QC-S30 Collator offers a unique space-saving design with integrated cabinet that can corner or side-staple up to 1,500 stapled set per hour.